Yemeni people attend the funeral of victims of a Saudi-led airstrike, in Saada, Yemen, Monday, Aug. 13, 2018. Yemen's shiite rebels are backing a United Nations' call for an investigation into the airstrike in the country's north that killed dozens of people including many children. The Pentagon has issued a warning to Saudi Arabia that it is prepared to reduce military and intelligence support for its campaign against rebels in neighboring Yemen if the Saudis don't demonstrate they are attempting to limit civilian deaths in airstrikes following a strike on a school bus that killed 40 children earlier this month, CNN has learned. Two officials directly familiar with the Pentagon's thinking tell CNN frustration is rising. Defense Secretary James Mattis and General Joseph Votel, head of US military operations in the Middle East are particularly concerned that the US is supporting a Saudi-led campaign of airstrikes which have killed large numbers of civilians. Human rights groups, some members of Congress and the United Nations have expressed concern about Saudi Arabia's actions for months to little avail. But after a series of recent strikes in which large numbers of civilians were killed, the Pentagon, as well as the State Department, have now delivered direct messages to the Saudis about limiting civilian casualties. "At what point is enough enough?" one official remarked to CNN. It is not clear if President Donald Trump, who views the Saudis as an essential ally, would agree to a reduction of support. The US currently provides air refueling for Saudi aircraft and some intelligence support although it's never been made precisely clear if the US provides any targeting assistance. US officials have long said they are trying to advise the Saudis on improving coalition processes and procedures to limit civilian casualties in airstrikes. But US military officials clearly believe the effort is not working. Mattis has increasingly focused on the Yemen situation since the August 9 Saudi-led coalition airstrike on a school bus in northern Yemen that killed dozens of children, many younger than 15, officials say. CNN has reported that the weapon used was a 500-pound (227 kilogram) laser-guided MK 82 bomb made by Lockheed Martin, one of the top US defense contractors. After that strike, Mattis told reporters he was sending a top US general to talk to the Saudis about what happened in the strike on the school bus. It's become clear the US military had authority from Mattis to take a tougher line with the Saudis. US Lt. General Michael Garrett had already planned a regular set of meetings with Saudi leadership on August 12, but the meeting was not routine and he delivered a tough message. "Recent events dictated to US military leaders that the situation required special mention and official emphasis during his visit," Lt Cmdr Rebecca Rebarich, a DOD spokeswoman told CNN. "Lt. Gen. Garrett delivered a message of concern regarding the recent civilian casualty incident, and on behalf of the US government continued to urge for a thorough and expedited investigation as well as continued emphasis on the reduction of civilian casualties in the Yemeni campaign." That message of concern raised the possibility that assistance could be cut. However, US officials have pointed out if the US pulls back, they will have little leverage to force the Saudis to pay more attention to civilian casualties. Former President Barack Obama had banned the sale of precision-guided military technology to Saudi Arabia over "human rights concerns." The ban was overturned by the Trump administration's then-Secretary of State Rex Tillerson in March 2017. The Saudi-led coalition in Yemen claims the United Nations is biased against it, a spokesman said Monday. Turki al-Maliki, said in a press conference held in Riyadh Monday that, "the coalition is surprised by some statements made by some UN officials either inside Yemen or at the United Nations (Headquarters) by taking biased positions regarding some reports claiming mistaken targets." 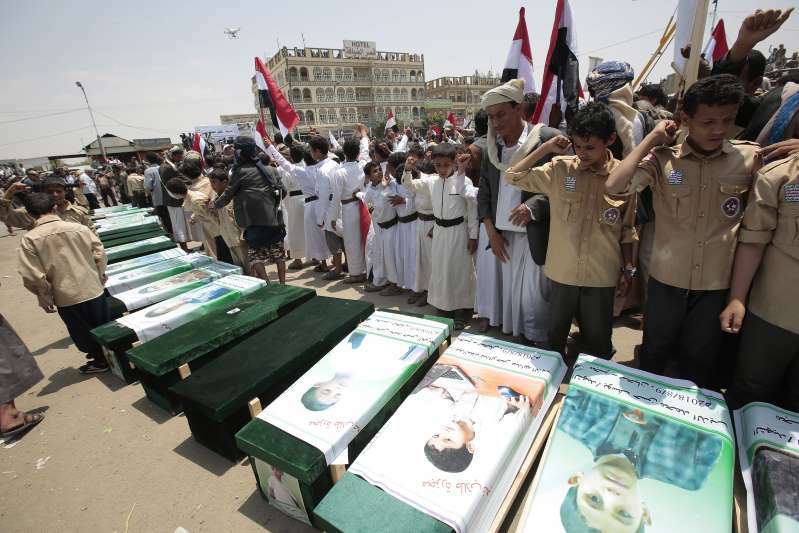 Last week, the UN condemned the Saudis after another set of airstrikes that killed 30 people, including 22 children, in a rebel-held area in northwestern Yemen. At the time, UN humanitarian chief Mark Lowcock said in a statement, "This is the second time in two weeks that an airstrike by the Saudi-led Coalition has resulted in dozens of civilian casualties." He added, "I echo the recent statement by the Secretary-General on Yemen, condemning such attacks on civilians and calling for an impartial, independent and prompt investigation into these most recent incidents."